The Nextreef reactor is the blue acrylic one. The pellets tumble gently from top to bottom in the reactor. 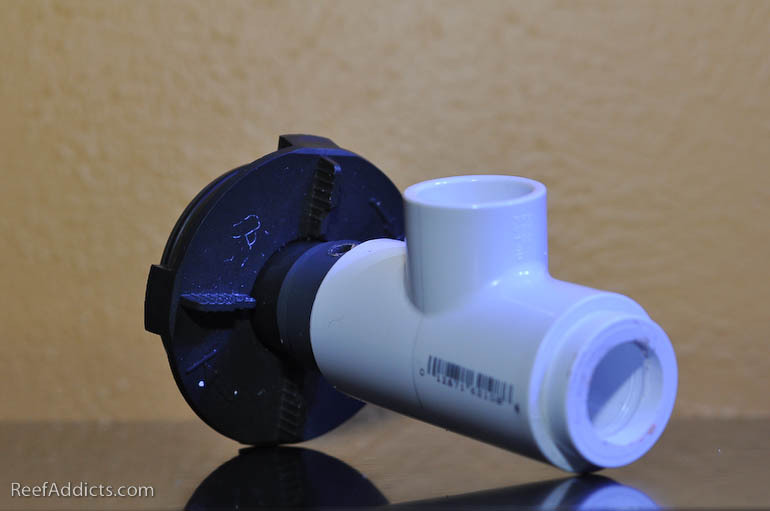 The output of the reactor goes into this fitting that I fabricated with a Tee fitting and cap. 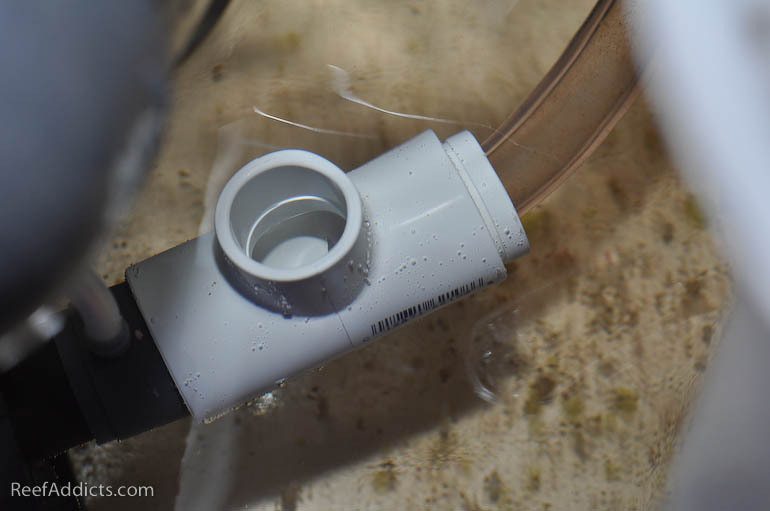 The piece fits over the intake to the Eheim pump, and the cap (drilled out in the forefront) accommodates the flexible 5/8" tubing. 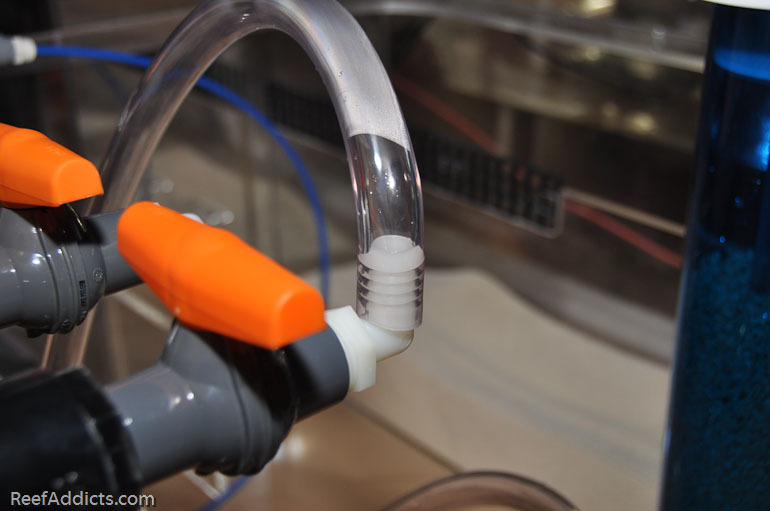 This this simple mod, the skimmer absolutely skims the effluent of the reactor, which likely contains dying bacteria. The other opening of the Tee fitting permits additional water to be drawn into the skimmer's pump. 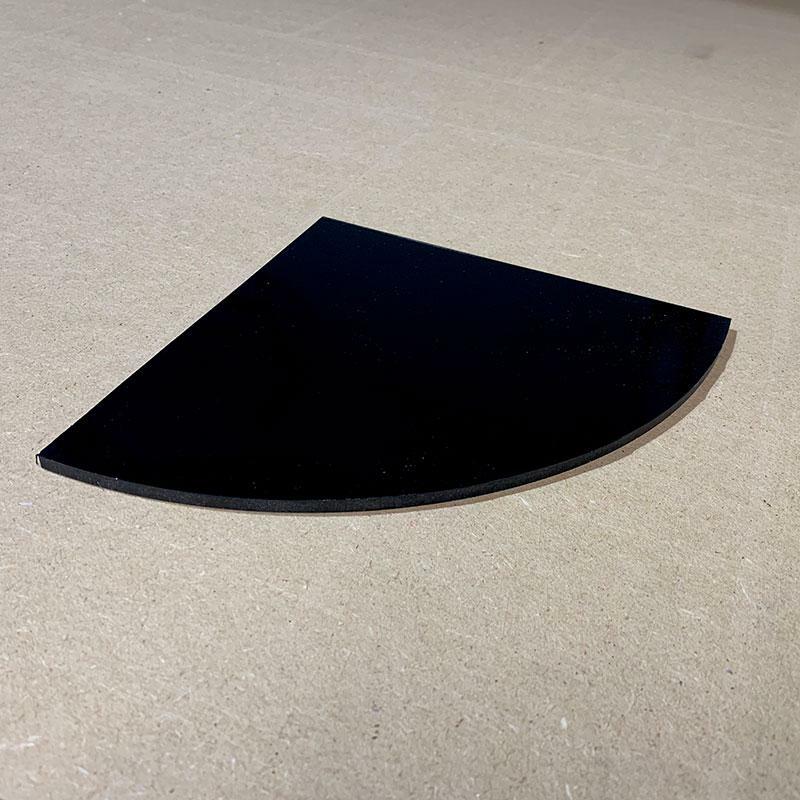 The lack of restriction has worked out very well, and the skimmer hasn't been altered or affected adversely. 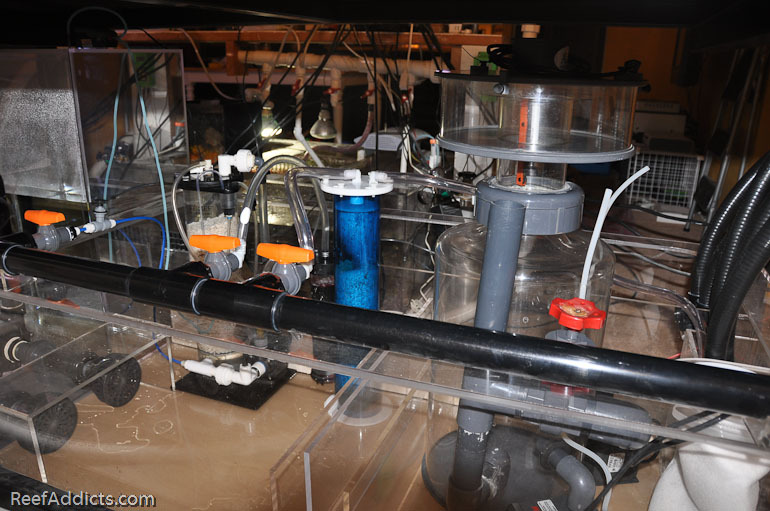 September 2011 to February 2012: I switched to Coralvue's BioSpheres to see how they run. 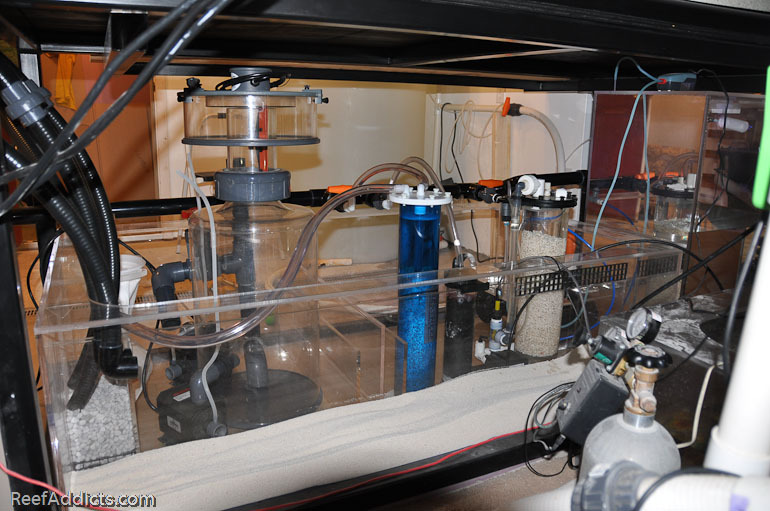 March to October 2012: Ran Ecobak biopellets in an AquaMaxx reactor to see the results. 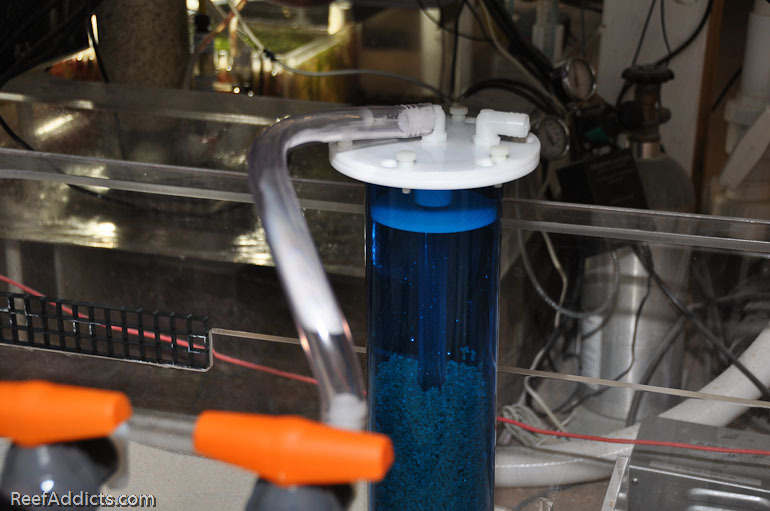 Skimming: The output of the solid media reactor needs to be pointed directly to the intake of a protein skimmer's intake pump. 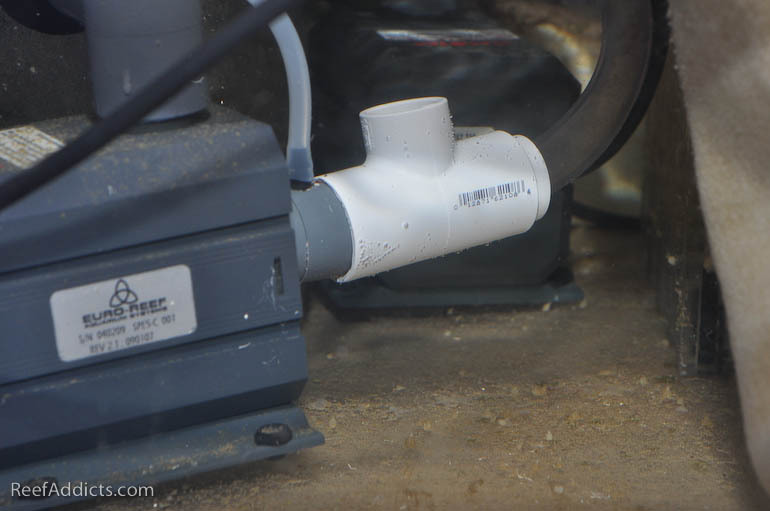 All effluent should be heavily skimmed, as this helps avoid issues like brown/reddish mulm on the substrate of the aquarium. If you enjoy a clean sandbed, heed these words. Bacteria: Dose the aquarium with additional bacteria in a timely fashion. With Prodibio, I dose every 15 days. With Microbacter 7, dose at least weekly. Replenishing the aquarium with additional bacteria has resulted in better results when it comes to running biopellets, which may add diversity to avoid a monoculture, and replace what has died off and being skimmed/exported from the system. Lighting: As the pellets break in (with bacteria), you'll usually notice a sudden increase of water clarity, and it may be necessary to reduce the lighting period to avoid bleaching livestock. If water was somewhat murky before, better clarity means more light penetration -- the corals can't adapt that quickly so adjust the daily light cycle to match the change in conditions, gradually ramping it back up to the normal schedule. Alkalinity: Running biopellets like EcoBak usually works best in tanks that keep Alkalinity around 8 dKH. Higher levels of alkalinity may result in burnt-looking coral tips, so weekly water testing should be part of your husbandry routine. GFO & GAC: You may decide that it isn't necessary to continue running granular ferric oxide. Running fresh granulated activated carbon helps keep water from becoming discolored, and isn't a problem in conjunction with biopellets. Feedings - Because the extra bacteria in the closed system is so efficient, increasing the feeding routine is best to avoid starving corals. By adding more food, those corals will retain their coloration. Multiple smaller feeding sessions would be better than one giant dose per day. 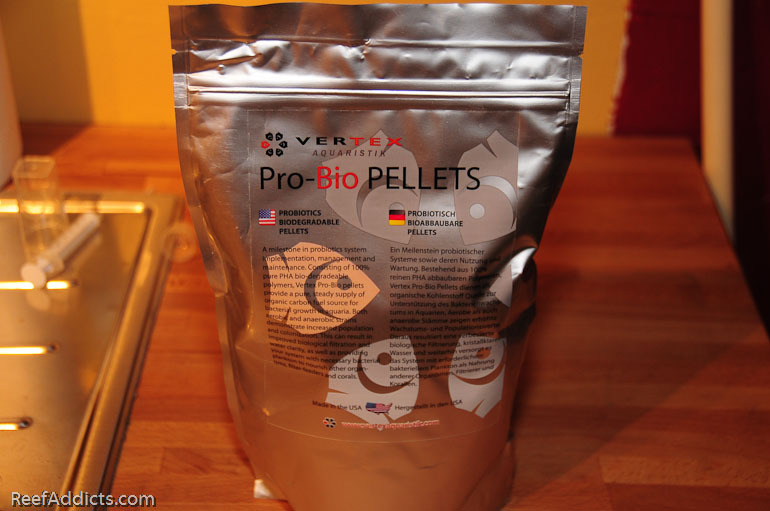 I've used biopellets for over three years with excellent results. (I'm still using biopellets as of August 2014) Using the suggestions on this page should help you do the same.